Buona domenica Pietro e speriamo che il tempo sia bello così ci regalerai delle nuovissime e bellissime immagini! I like it! The title is perfect to describe the action going on. Pietro: Very nice painting, as an engineer I like the lines and shapes. The colors are really neat. Oh this image sums up me perfectly, Pietro! Buonasera Pietro, oggi dalle alture sono calate nubi...in esaurimento. This image is a wonderful set of stars reaching, reaching to connect as a star. Beautiful. Buon inizio settimana Pietro, bella "Improvisations"!! 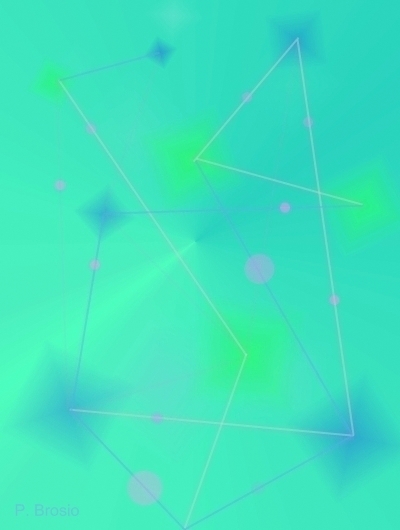 If these are communicating thoughts they are very geometrical ! Love the colors ! I'm truly entraced by it Pietro! Did you paint this or where did you find it? Happy Monday! This is beautiful work full of light. I love its transparent look and gentle colours. It makes me feel comfortable while looking at it. Your title goes great to the photo. I am glad you like the return of Leaves of Grass. You are always welcome to my "house". I like the colors and the title. I love the subtle design of both the lines and what almost looks like their shadows. the different points of subtle color really ties everything together as well. You picked the perfect background color too. Excellent work Pietro. You are a wonderful artist. 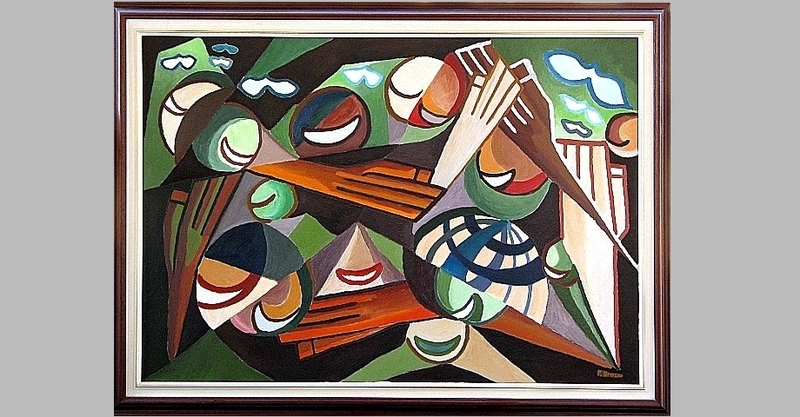 Pietro it's great and the colours chosen for this painting and the use of geometrical shapes make it quite psychedelic. A very interesting piece of art. nice! you made it out of art? creative improvisation. I like it! I am glad with your double visiting to my blog! Colors are fantastic and you have chosen such an appropriate title for this piece! Hi Pietro! I truly like this one!! And Gobbi... He came to the São Carlos in Lisbon for the first time in 1951 and kept coming here. Awesome!! I don't know why exactly but I really like this. Maybe the overall colour so relaxing that appeals. I love the shades. Very soothing. Mais au lieu de créer quelque chose d'explosif, la couleur que tu as choisi m'évoque la douceur. Des connexions provoquées naturellement, et non provoquées par l'homme dans la confusion. C'est amusant de lire ce que chacun y voit. Une suggestion et autant d'interprétations que de visiteurs. C'est la richesse de l'esprit humain. Désolée Piétro de ne pas être aussi régulièrement sur les blogs. J'ai des préoccupations personnelles qui me tiennent éloignée à certains moments. Mais c'est une joie de revenir à chaque fois. Merci d'être toujours présent Piétro. C'est un plaisir et réconfortant d'avoir un "ami-blogueur" sur qui l'on peut compter.